Caesar salads are something that I associate with being 18 or 19 years old. It was the sure thing I’d order when eating dinner out with a group of friends on a Friday night. A caesar salad and a gigantic sweet n’ sour blue cocktail. I’ve given up drinking blue lagoons (or anything that shockingly vivid), but it’s nice to have an old favorite hanging about now and then. Garlicky, creamy and with bits of bacon and toasted croutons, what’s not to love? Sure it packs on the calories, which is why I only make this salad once in a while. Most caesars have raw egg and anchovies and while I’ve got no qualms eating it when someone else is making it, I’ve yet to try making a raw-egg dressing myself. So this dressing is a standby that is super simple to whip up and it tastes just as delicious. It’s also really easy to adjust. If you are vegetarian, cut out the bacon & use a worcestershire sauce that is vegan (Annie’s makes a good one). If you are vegan, use a soy mayo & leave off the cheese. Elsewhere: Want to bring the Baja to your kitchen? Check out my post for some seriously awesome fish tacos with a cumin-yogurt crema over at Poppytalk. Wash and dry lettuce, tearing into bite-sized pieces. Place in a large bowl and set aside. Fry up bacon over med-high heat until crispy. Remove the bacon and set aside. Remove most of the bacon fat from the pan and add in the bread cubes and the garlic. Toss until bread gets golden and slightly crispy. Set aside and make dressing. Put the above ingredients in a jar, screw on a lid and give it a big shake. Pour over salad & toss until everything is coated. Add bacon, croutons and parmesan cheese and give everything one more toss. Serve immediately. Serves 4. You read my mind! I only eat Caesar salads when I feel they’ll be very good. I had such a good one this weekend it made me resolve to make them at home. I like anchovies, so I’ll add them to mine, but I’m a bit iffy on raw eggs myself. Thanks dude! 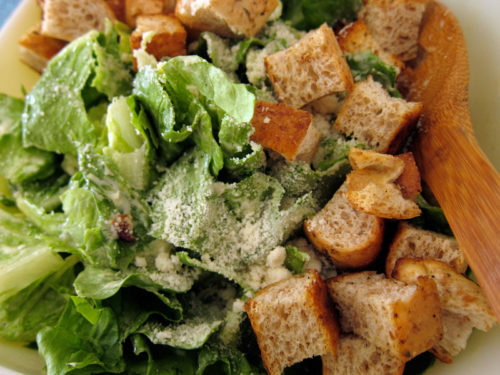 Caesar’s with good dressing are hard to come by…I can’t wait to try this! Mmm, that looks like a perfect summer meal. I have really been craving Caesar salads lately. Love that this recipe also requires no anchovies. I just can’t wrap my head around those little guys. Oh gosh, there’s nothing like homemade croutons. Raw-egg dressings should be left to the pros, but croutons always taste better when you make them yourself! Caesar salad was completely unknown to me as a teenager. It had just never crossed my path. When I did finally see a Ceasar salad at ‘The Olive Garden’ for the first time in my 20s, I can’t say I was excited. I mean it was just romaine lettuce and croutons, right? Friends of mine were excited about their Ceasar. I could care less. It wasn’t until I was well in to my 30s (yeah, that recent) that I made Caesar salad for the first following a recipe from Giada of ‘Everyday Italian’, and I was hooked. I loved the no-egg, anchovy-based dressing, the super salty Grana Padano cheese, and the croutons made from polenta cubes. I suppose not a classic Ceasar but very tasty. Anyway, your Caesar salad dressing sounds delicious, and who can resist homemade croutons! Yum! I too have given up all blue drinks as a result of too many during my teenage years! One night in Mexico and NEVER again! 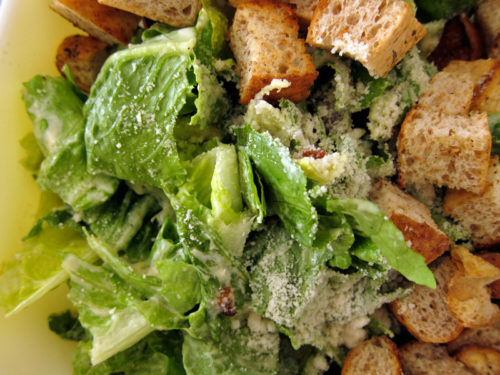 Also, I will have to re-introduce myself to the caesar salad…it has been far too long! Caesar salads are very satisfying, but I must admit that I usually don’t eat them do to their calorie packing properties and the raw egg thing can be tricky. However, I do love them. I wonder how the salad bit (with your dressing) with a poached egg on top (maybe double-yolk) would do? ohhh I miss caesar salads, time to make this one tonight! Love the dressing…looks awesome! Mmm I love a good Caesar salad. I need to find that Annie’s worcestershire sauce! 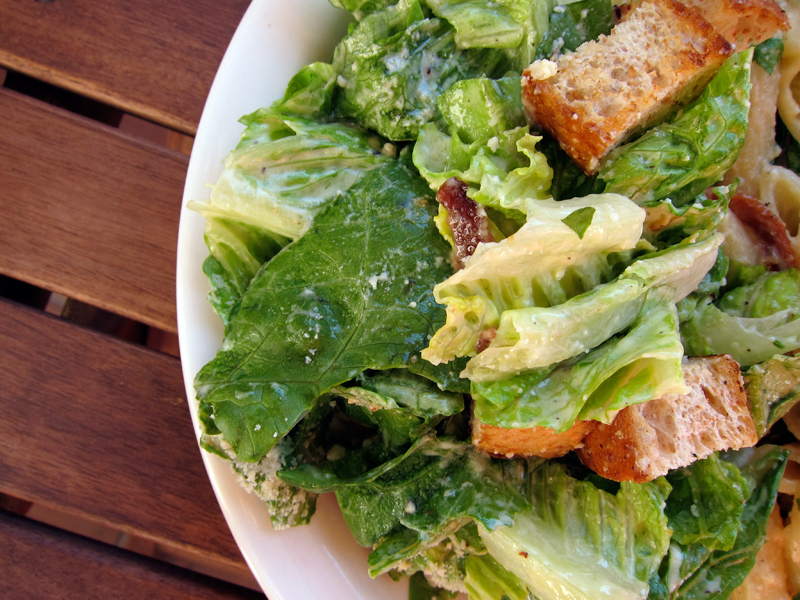 Oooh – I’ve been craving a good Caesar salad lately. Thanks for the recipe! I love simple recipes with delicious results. I’ll have to give this one a try! Glad I could help, Lydia. Yes, feel free to add anchovies…me, squeamish about that too! I hope you do, Joanne, it’s a good one. Me neither, newly wed. I don’t think we’re alone on that one! Bijoux, you’re forgetting about the bacon! That version sounds pretty awesome and I love the idea of polenta cubes. Haha, sorry to bring up those memories, PCWG! Tracy, I think an egg on top would be awesome. Wow, what a great idea for a deconstructed salad. Ashley it isn’t too hard to find. Even my chinatown market carries it. I hope you enjoy it, Nicole. I used to love a good Caesar but would usually end up feeling sick afterward from too much dressing. I started making my own to satisfy the craving and liked it so much better. I’m a little tired of my dressing though and am really eager to try a new one. Mmmm I will always love caesar salads! They remind me of being young too (my mom makes a fabulous one!!). But I’ll always love them.. Especially with some steak tips thrown in. I’m with you – skip the blue cocktails and bring on the salad. How could you ever tire of such a lovely salad? Dana, just add enough dressing so that you feel comfortable. This recipe makes a bit more than I needed (maybe about a tablespoon too much) – I certainly remember that caesars at restaurants can get gloopy! Sues, glad your mom made a good one. Lucky! I am loving your blog! SO many great recipes! This one is lunch tomorrow! I only made the dressing, it was delicious!!!!! Ron, glad you liked it. It’s a great and simple dressing. This is now my go-to Caesar recipe. I used to make the Re-bar recipe but this is easier and tastierthis. I made it with bacon last night for the first time. Delicious with and without. And my kids eat it too, which is fantastic!